Seating is not guaranteed with this ticket and if you want guaranteed seating, please see "SEATED ADMISSION" below. NYC Times Square’s hottest New Year’s party is just a half block from the fabled ball drop at Dallas BBQ. 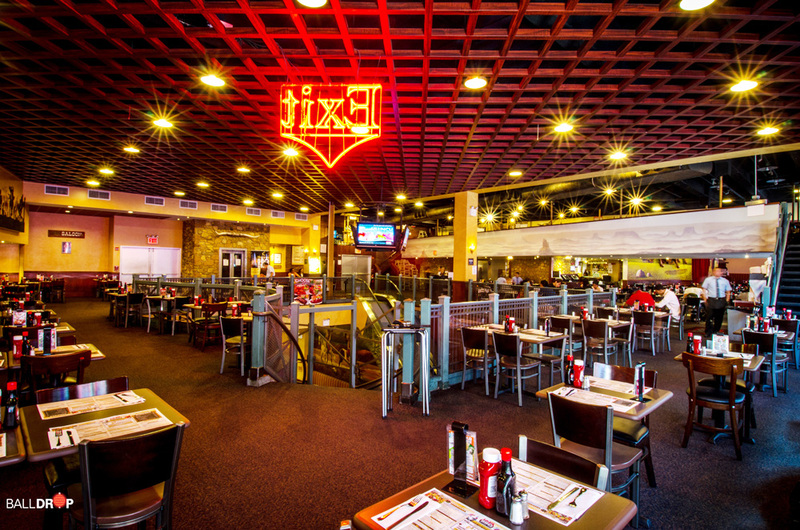 This year, Times Square’s favorite BBQ joint is rolling out the best party to satisfy all your New Year’s appetites. Come for BIG FUN, NYC party people and fun seeking families. NYE revelry will be a stone’s throw from the Times Square ball drop at NYC’s best place to party, Dallas BBQ. For 2019, this satisfying event will be serving up all kinds of festive amenities: a 6 hour open bar will get all those 21 and over in the NYE spirit, and for the younger folk, 6 hours of unlimited soda, water, and juice will be avail, so this is one NYE party that really has something for everyone. And speaking of something for everyone: Dallas BBQ will be serving up 3.5 hours of selections from their renowned menu. The event comes alive with a live DJ spinning the best hits, Top 40, Pop, Hip Hop and Mash Ups to get everyone in the spirit, the party at Dallas BBQ is really one of a kind. And you know no one from Dallas Texas would skimp on a time honored custom, so Dallas BBQ has a complimentary champagne toast at midnight to send you into the New Year with a fantastic taste of tradition. Dallas BBQ takes the adage 'go big or go home' to new levels, making this BBQ-centric venue a New York City specialty. If you're looking for the best night out on the world’s best town, you've found it. Right in the heart of NYC’s Times Square, Dallas BBQ creates excitement with its creative décor, while the staff lends this sprawling space a sense of southern charm and hospitality. 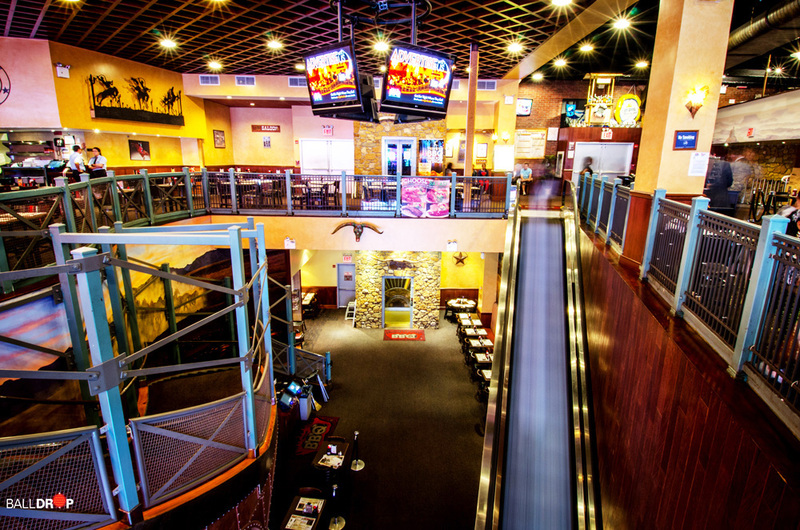 The spacious two-level venue is like stepping into your favorite (Texas sized) family-friendly restaurant, with neon signs, hanging lights, and kitschy giant murals featuring water buffalo on the walls. Hi Def TV screens are anchored from the ceiling and scattered throughout the venue. Welcome to the party, NYC. This year, the best NYE party in NYC is a Texas sized affair. 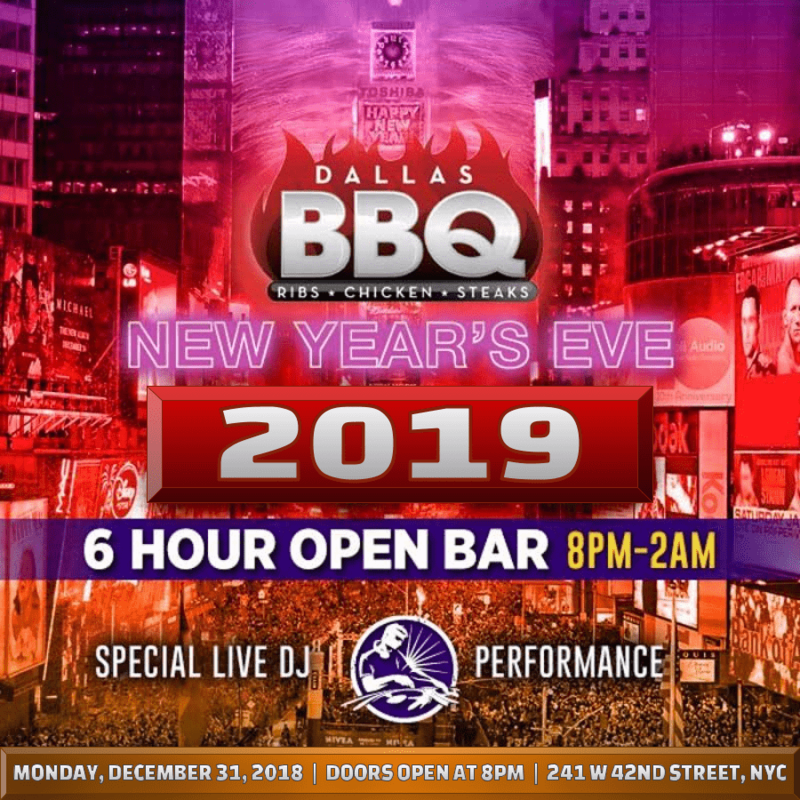 With all the best amenities in Times Square, Dallas BBQ is ready to help you and your favorite friends and family send a hearty hello to 2019. *** Enter the Times Square area at 41st Street & 8th Avenue (NE Corner) as regulated by NYPD. Admittance restrictions may be in place during the ball drop (11PM - 12:15AM). Regardless of admittance time to your party, make sure to enter the Times Square area no later than 8PM.